A 1,400-calorie meal plan can be both filling and satisfying when meals include healthy food choices from all the food groups. Carbohydrate foods should be included at each meal and snack to promote blood sugar control. In addition, ensure that meals and snacks include a variety of lean proteins, healthy fats and vegetables. A 1,400-calorie low-fat, diabetic meal plan includes 12 carbohydrate exchanges, five proteins and four fats. Use this sample as an outline to create more menus by substituting, or exchanging, other foods from the same group. To learn more about the exchange system, visit the American Diabetes Association website. Breakfast should be consumed within two hours of waking. Resist the temptation to skip breakfast, as this will not promote weight loss or help improve blood sugars. Aim for a mix of healthy carbohydrates in combination with a healthy source of fat. 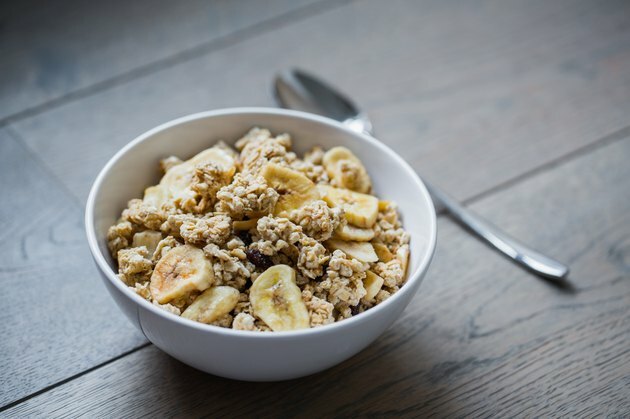 For example, eat 3/4 cup of unsweetened whole grain breakfast cereal, 1 cup of skim milk, one small banana, four walnut halves as your fat and 8 oz. of coffee or hot tea with artificial sweetener. Including snacks between meals helps to stabilize blood sugars throughout the day. Plan to eat a healthy snack about two to three hours after breakfast. One carbohydrate choice, such as a small whole grain granola bar, is adequate. For lunch, enjoy a healthy meal from home. Avoid fast food and restaurant meals as they are typically very high in fat and calories, therefore challenging health goals. Try this easy-to-pack sack lunch. If time is short in the morning, pack your lunch the night before. Pack 2 oz. albacore tuna made with 1 tbsp. low-fat mayonnaise and 1 tbsp. pickle relish, 10 whole grain crackers, one small apple and 1 cup sliced bell peppers and tomato wedges. If you don’t like fish, a turkey sandwich on whole grain bread may be substituted for tuna and crackers. A mid-afternoon snack helps to prevent hunger and the urge to overeat at dinner. The ideal snack is a combination of carbohydrate and protein or fat. A 6-oz. container of low-fat yogurt is ideal since it contains both carbohydrate and protein in a low-fat package. Low-fat Greek yogurt is even more filling because it is higher in protein. A well-rounded, home-cooked dinner doesn’t have to be difficult or time-consuming. By preparing meat in the oven, you can do the prep work and then move on to other tasks while it cooks. Serve yourself 3 oz. of baked pork tenderloin marinated with 1 tbsp. balsamic vinegar, 1 tbsp. Dijon mustard and 1 tbsp. fresh rosemary, 2/3 cup wild rice, 1/2 cup steamed carrots, a small vegetable salad with 2 tbsp. low-fat salad dressing and a small dinner roll with 1 tbsp. light margarine. A small evening snack of one carbohydrate choice may help to lower blood sugar the following morning. A serving of starch or low-fat dairy is preferable to fruit because they take longer to digest and tend to benefit fasting blood sugar the most. Half cup of sugar-free chocolate pudding meets these criteria while satisfying a craving for sweets.